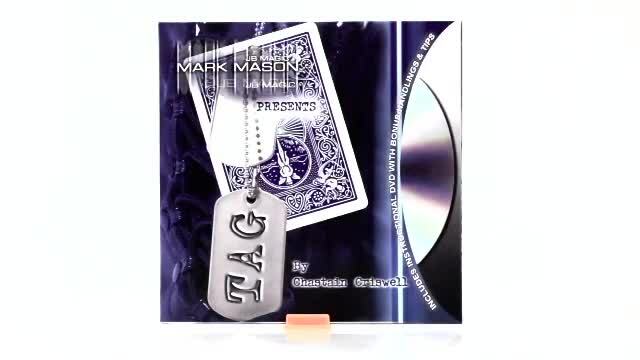 Today, when you order "TAG by Chastain Criswell and Mark Mason", you'll instantly be emailed a Penguin Magic gift certificate. You can spend it on anything you like at Penguin, just like cash. Just complete your order as normal, and within seconds you'll get an email with your gift certificate. 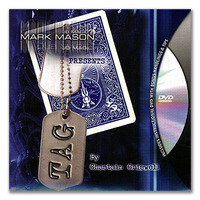 TAG by Chastain Criswell and Mark Mason (DVD + Gimmick) A bullet-proof card miracle that happens IN THEIR HANDS. As fooling as card magic gets. LIMITED SUPPLY JUST ARRIVED. ORDER BEFORE MIDNIGHT AND GET FREE SHIPPING. ANY card is freely selected, signed and returned into the deck. The magician then removes any card from the deck. A GENUINE hole is punched through the incorrect card. Next a tag is passed through the hole and tied so the card is fastened to the tag, NO FAKE TAGS etc. The spectator takes hold of the tag as the card is returned to the deck. The spectator never lets go of the tag. The deck is spread and the spectator pulls the tag from the deck. The card FASTENED to the tag is now THEIR signed card! This can be given away as a souvenir, the tag is permanently fastened to their card. Complete with gimmick, tags and an instructional DVD which includes detailed explanations, routines and BONUS ideas and tips. I give pretty harsh reviews to tricks that oversell themselves, but this one actually works. Some people said they were up and running with this trick in five minutes; it took me about an hour to practice it because I wanted to come up with workarounds for all the points in the trick where I wasn't sure my card handling skills were good enough to prevent flashing, etc. Note, like most tricks that claim there are "no moves involved", there are... some moves involved. You do have to either (a) be good at card handling, or (b) come up with some awkward patter to cover for not being good at card handling. Without giving anything away, for example, there is a point that you have to riff to a small break in the deck and cut the cards there to control a desired card to the top. Good card magicians can do that without thinking. 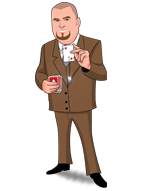 Me on the other hand, I peek at the deck, riffle my thumb along the edge, and say, "I'm going to count to card [whisperwhisperwhisper] thirty-five...", break the cards at that point, and then reveal the card which is *not* the spectator's card. The way I do this is just to make a faux-dramatic expression while I'm riffing and counting and say "Wouldn't you be amazed if this was..." and then reveal the card and say, "Just kidding, that's not your card." So then to the spectator, the riffing and the counting was all just part of the joke, and it doesn't register with them as "cheating" since in their mind you didn't actually use it to accomplish anything. 16 of 16 magicians found this helpful. Let me just say this - I have never been so fooled as when Mark did this to me at the New Zealand convention! In fact my signed card with the tag attached sits in my wallet as a reminder of what real magic is like. The secret is surprisingly clever but simple and the routine is very easy to do. Basically this can be summed up as - a card changes into a signed card under the most impossible conditions! The hole is real, the tag is real and can be signed, the knot is real! I really really enjoy doing this trick. If there is a downside to it you have to carry around tags and a hole puncher. The "Gimmick" is very clever and easy to make. I have, as most people will, changed up the presentation a bit. I noticed in the demo video he replaces the card from the back, but there is no reason you can't load the card in from the front. Also, after the card is replaced, I ask them to hold the tag very tight, and I just take half a step back, and let their card be pulled out. After you put the card with the tag on it back into the deck, the trick is done. No funky moves. You could have one person hold the deck and another hold the tag. The gimmick can be added into the deck, and removed with minimal effort. Although the deck can't be held up to close scrutiny, the gimmick is not very obvious. TAG is a very easy trick to do, which allows you to put all your concentration on performance. For the Hobbyist, it's fun to perform, for the Pro it gets your contact info into their hands to keep. Incredibly easy to do and very deceptive. When you practice it you will mainly be working on your patter instead of fumbling around with difficult sleight of hand. The only reason I did not rate it 5 stars was because the gimmick I received was slightly damaged, so I had to make a new one. Don't let that deter you from getting this trick because the gimmick is very easy to make when the one that comes with it wears out, or on the off chance that you recieve it in less than perfect condition. This is a great trick with a great ending although I seldom perform it due to the fact that I'm not a stage magician and don't often walk in and out of bars with a hole punch in my pocket. The gimmick is also something that can easily be viewed so being good with misdirection is a plus as it is with most tricks. Also,the gimmick needs refurbishing more often than Mark suggests and is tricky to get just right. All in all this is an awesome trick that just doesn't work well for what I do. If you are someone who would not find it impractical to have price tags and a hold punch in your pocket for just one trick, or do more performance style magic with storage for props than I say get this! it is an awesome reveal that really gets inside peoples heads! I particularly liked the suggestion of using a business card instead of a tag, one of the more ingenious business card presentations I’ve seen in a long time. I did take off a star because of the cost. While the list price is very reasonable, you will need to spend at least $10 more for additional supplies. Even if you already have a hole punch, you will need a certain something to “recondition” the gaff. This is a flaw that several mentioned on the “Penguin’s Only” discussion of this effect. But on the plus side, the gaff is simple enough that you won’t have to shell out for a brand new package when the entire gaff needs a full replacement. One more comment is that I was surprised by the 2005 copyright on the DVD. I know that this was first released in England. But there is no reason that something this innovative should have taken so long to be a Penguin bestseller here. I will debut this tomorrow to my Sunday school class, and expect this to be a worker of mine for a long time. I am pleased. Usually when you see an effect it tends to be better in the online preview than when you get it... this is NOT the case with Tag however. It's a fantastic effect that absolutely kills! I'm guessing 70% of the time the mark ends up dropping the tag/card out of fear/amazement/surprise/etc. It's so simple to do, no crazy moves that require you to be a hand contortionist, etc. And the DVD covers repairing the gimmick, which is important for any effect... Did this to my 'test audience' (the wife and 17 year old daughter) and fooled them both easily, which is hard to do as my daughter does a bit of magic herself. A really good trick at a really good price! This one goes in the 'keep forever' pile! Thanks PM! I buy a lot on this site, and I have to say this is by far the best in a long time. This thing requires carrying around a few items, but it works for any occasion. It played huge on stage, it gets big reactions in walk around, this is a great illusion. In some instances I've started with Wedge (pretty good illusion, especially to set up card tricks), and I have followed it up with Equilibrium. Great stuff, works on any deck of cards, and just know you'll be going through a lot of cards, because you'll keep performing this because it'll keep amazing you! As simple as it is, this hits hard. Easy to do, practical, everything you want in a magic effect. The tags used are on Amazon (I didn't see them available here) $6 for 100 or oddly enough $10 for 1000. You are supplied with a dozen tags and one gimmick and also tought how to make more gimmicks. This is another winner from Mark Mason that you will use and will not end up in the junk drawer.